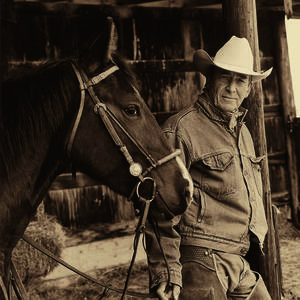 Ian Tyson (born September 25, 1933) is a cowboy folk singer from Alberta, Canada who was born in Victoria, British Columbia. He and his then-wife Sylvia Fricker constituted one of the most popular folk duos of the 1960s, Ian & Sylvia. Tyson gradually shifted to the cowboy way while still with Sylvia, accentuating the western life through song. Residing on a ranch in southern Alberta, Tyson tours all over the west. He and his then-wife Sylvia Fricker constituted one of the most popular folk duos of the 1960s, Ian & Sylvia. Tyson gradually shifted to the cowboy way while still with Sylvia, accentuating the western life through song. Residing on a ranch in southern Alberta, Tyson tours all over the west. In 2005, CBC Radio One listeners chose his song, "Four Strong Winds," as the greatest Canadian song of all time on the series 50 Tracks: The Canadian Version. There was strong momentum for him to be nominated the Greatest Canadian, but he fell short. He has been a strong influence on many Canadian artists including Neil Young, who recorded "Four Strong Winds" for Comes a Time (1978). Johnny Cash would also record that same song for American V: A Hundred Highways (2006). In 2006, Tyson was afflicted with a throat virus resulting in damaged vocal cords and a major change in the texture of his once mellifluous voice into a far hoarser quality. Nevertheless he has recently cut an album, Yellowhead.